Hillsides, especially steep slopes, can be challenging to landscape. 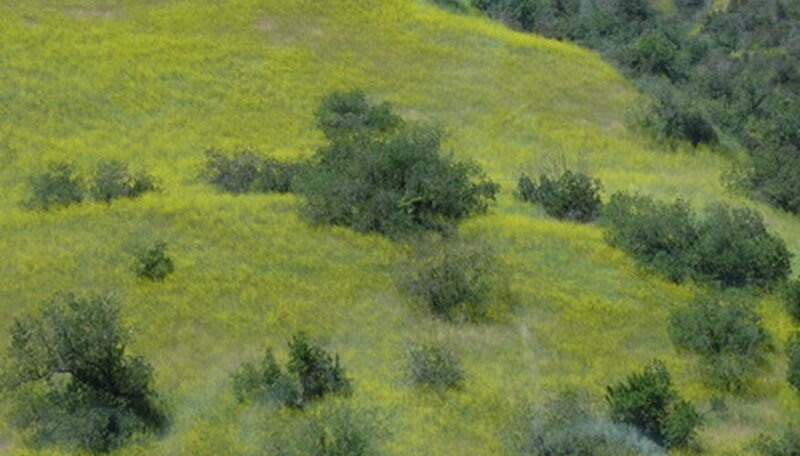 Hillsides that get full sun can possess some other limiting factors because of the risk of sun damage to your plants. However, many plants can work well as ground cover plants or accent shrubs on medium to steep slopes. A number of creeping or low shrub junipers are ideal for sunny slopes. Junipers are very hardy and can easily grow on steep or moderate sunny slopes. As a drought tolerant so they can help you minimize water usage as part of landscaping. Creeping junipers, or Juniperus horizontalis, are slow growing to medium growing shrubs that can grow in mats 12 to 18 inches thick. Other junipers can work as shrub or clumping plants. Dwarf Japanese garden junipers, sometimes called "nana," are small bushes that have blue-green foliage in the summer that turns purplish-bronze in the fall. Although often listed as growing in shade or partial shade, the cut leaved stephanandra also grows well in full sun as long as it gets enough water. This low growing bush grows very quickly to its maximum size of 2 to 3 feet high and 2 to 3 feet wide. In addition, planting a series of these bushes can create a sun tolerant ground cover that is taller than some of the juniper ground cover. In some cases, this plant will create ground cover by sending out suckers. Chenault coralberry is a flowering shrub that does well in full sun on hillsides. This shrub can grow to around 5 feet tall and 5 feet wide. The chenault coralberry is a fast growing shrub that features pink flowers and fruits. Some cultivars of this bush are useful for ground cover. The Hancock cultivar only grows to 2 feet tall, but can spread to 6 feet is diameter. By planting several of these cultivars in close proximity, you can create a flowering, shrub-like ground cover that will do very well on sunny hillsides.